Are you a gourmand? Do you like diving? Do you want to see the most charming views from the lighthouses? Malaysia welcomes you to see what you like! There are many worthy variants to see something exciting. Here is the list of the most important and interesting islands in Malaysian territory that are definitely first for visiting. It does not matter which of them you choose. It depends on your plans and preferences. It is not easy to get there. Perhentians are situated at the North-West Coast of Malaysia. This is a cult place for all tourists, who like hiking. The water at the island is very clean. 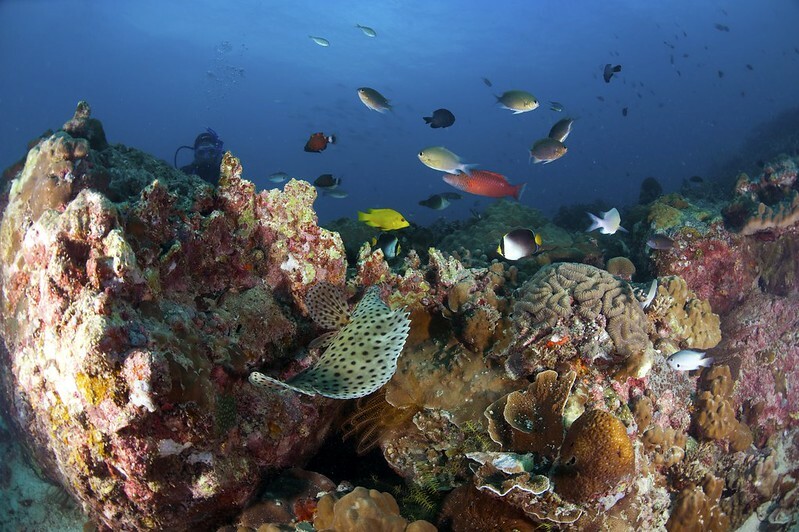 You can easily go snorkeling just at the coast, watching the colorful underwater inhabitants. You can use the help of the local fishermen to take you to watch turtles and sharks. The evening program is rich in the bar cocktails and fire shows on the beach. Where to stay: looking for high-class service, pay attention to the Tuna Bay Island Resort; looking for something plain and simple, you may visit the Abdul Chalet. How to get: you may use the help of the public transport. The buses go from the Hentian Putra Bus Stop in Kuala Lumpur. You can also use the air help from LCCT airport. The island is included in Pahang state. Nevertheless, it is more comfortable to get there from Johor. Just hire the car in Johor Bahru and get to the beach line to ride the boat or ferry. This is a feast island. It is very popular for tourists for two main reasons. Firstly, the rich and picturesque landscapes make this island the most favorable background for many different films. Secondly, it was named the most beautiful island in the world. The island is still rich in wild exotic nature. You can meet the big number of huge varans here. Where to stay: pay attention to the Bagus Place Retreat. Waiting for something special, you may stay at the JapaMala. How to get: there is a small airport in the island. You can use special air routes from Kuala Lumpur and Singapore. The island is situated on the very border of Thailand. The legend says that that the island was cursed in 1819. The women cursed the island, when she was send here to death. The island was poor and dark place for many years. It took much time for Malaysian government to rebuild it to be attractive for tourists. This is a popular resort island now. It was proclaimed the tax-free policy in the territory of the island. So, the popularity of Langkawi is still growing. The best way to see the beauty of this place all together is ride the ropeway that is 220 meters high. Where to stay: if you don’t care of comfort and high-class service, you may stay at Bon Ton – eight houses, built in traditional Malaysian style. The houses are placed in the territory of coco plantation. What something more comfortable? Pay attention to Four Seasons Resort Langkawi. The hotel welcomes visitors of all classes and budgets. How to get: it is better to get to Langkawi from every corner of the country. The dozens of routes go to the island from Kuala Lumpur, Singapore, Penang. The pearl of Malaysia boast the rich and bright history. The island was firstly discovered by the captain Francis Light in 1786. It was the pearl of the British Empire for many years. Singapore and Penang were the British colonies at that time. They were the important stand points to form the trade relations between Asia and India. Nevertheless, the meaning of the island has changed. It becomes the popular touristic place with the biggest IT center on it. Today, the heap of Penang is proud of the island history. Nevertheless, the main touristic attraction is the food street: traditional soup, seafood, baked bananas and others. What is more, the island becomes more and more comfortable to live: transport, public transport, festivals, green plants. There is nothing better than food festival. Where to stay: pay attention to the Lone Pine in the North of the island. The hotel was built in 1948 and renewed not. If you want to learn something interesting from the history of Penang, you should pay attention to Penaga in the very center of Georgetown. The next hotel attracts people with its chick and elegance – Eastern & Oriental Hotel. The hotel is placed in the restored ancient building. How to get: the planes from all over the world come to Penang. You can get to everywhere from the island if you could hire a car or ride a bus. The public transport is also available. The island is situated at the coast of the East Malaysia. Labuan is tightly placed between the Sarawak and Sabah. Labuan is one of three federal territories. It takes the special status to be the off shore business center and tax-free zone. It allows having the active investments: more than 6500 offshore companies are based here. The government of Malaysia thinks of the island as the future world offshore business center. If you are not interested in finances, you may have a lot of other reasons to get there. How about the ship wreckage? So many ships were broken at the shore of the island. This is the most attractive place for diving. There is also a military cemetery here. More than 3900 soldiers are buried on the island beautiful nature. This is good chance to learn Malaysian history. Each island has its own history. Where to stay: looking for the place with the high-class service and comfortable suits, pay your special attention to the Tiara Labuan and the Grand Dorsett. How to get: you are offered to use one of the numerous flights from Kuala Lumpur, Miri or Kota Kinabalu. There is also a ferry from Brunei.